anlabyhouse: Purse for Laurie's wife, Marion. Purse for Laurie's wife, Marion. 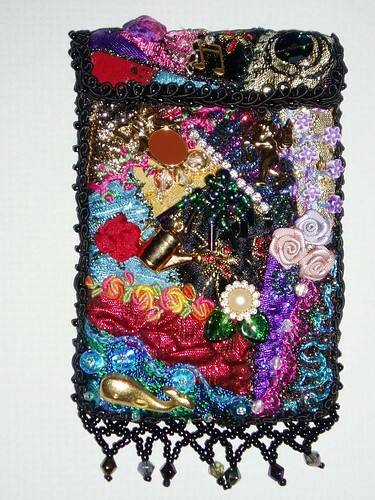 This is the second ATC size purse that I made. It was ordered by Laurie from work for his wife Marion. She is into gardening, so I gave her the watering can with "water" trickling out onto the pearl and diamante flower, music; so she has a music note charm on the top flap and she and Laurie have been whale-watching while on holiday so I just happened to find the gold whale button which I put on the bottom piece of fabric because it reminded me of the colour of the ocean. The beads along the bottom of this purse are Indian furnace glass in various colours.